On 30-31 October 2009, the Center for Civil War Research sponsored the Conference on the Civil War: Leadership. Panelists attended from across the country, from the University of Virginia to the University of California, Los Angeles, addressing aspects of Civil War leadership including military, civilian, and religious. Presentations included discussions on the careers and post-war representations of such figures as John Bell Hood, Benjamin Prentiss, and U. S. Grant. Panelists also addressed largely neglected aspects of wartime leadership, emphasizing the contributions of women’s aide societies and the significance of African American leadership, both before and after emancipation. Renowned keynote speaker Dr. Joan Waugh presented portions from her current project, “U.S. 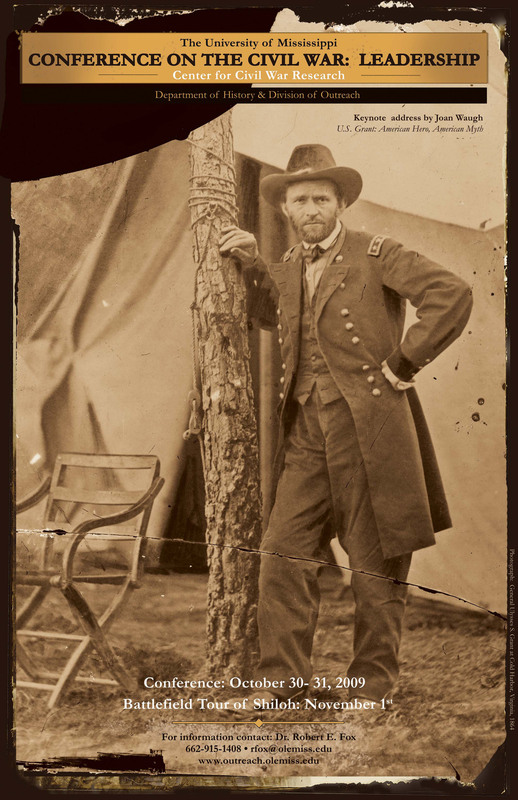 Grant: American Hero, American Myth.” Dr. Waugh addressed the dramatic shifts in Grant’s post-war popularity, utilizing depictions of Grant in popular culture to demonstrate the reduction of the once-revered general to a punch-line, often at the expense of his highly exaggerated alcoholism.